View of the ruins of the Dutch Factory in the W. suburbs of Patna City (Bihar) showing the great revetments on the River Ganges. 17 November 1824.
bl.uk > Online Gallery Home	> Online exhibitions	> Asia, Pacific and Africa Collections	> View of the ruins of the Dutch Factory in the W. suburbs of Patna City (Bihar) showing the great revetments on the River Ganges. 17 November 1824. Pen and ink drawing by Sir Charles D'Oyly (1781-1845), of the ruins of the Dutch Factory in the western suburbs of Patna City in Bihar, dated 17th November 1824, from an album of 80 drawings of views in Bengal and Bihar taken between January 1823 and May 1825. 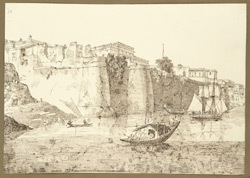 This image is one of a group of miscellaneous sketches which were made either at Patna, D'Oyly's headquarters, or at near-by Hajipur in March and October 1824 and May 1825. Patna, the ancient Pataliputra, was the centre of the opium trade in northern India. The Dutch, French, Danish and British East India Companies all had 'factories' there. The Dutch Factory pictured here was taken over by the British in 1824. Patna is now the capital of Bihar.